Benedictine Brother Peduru Fonseka knows what it means to be a minority. He grew up in Sri Lanka, an island nation off the southeastern coast of India, where Christians make up only 7 percent of the national population. 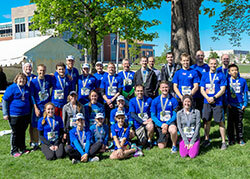 So it didn’t bother him to be part of the Race for Vocations team, made up of only 300 of the more than 22,000 people who participated in either the OneAmerica 500 Festival Mini-Marathon or the Finish Line 500 Festival 5K, both of which occurred on May 6 in Indianapolis. 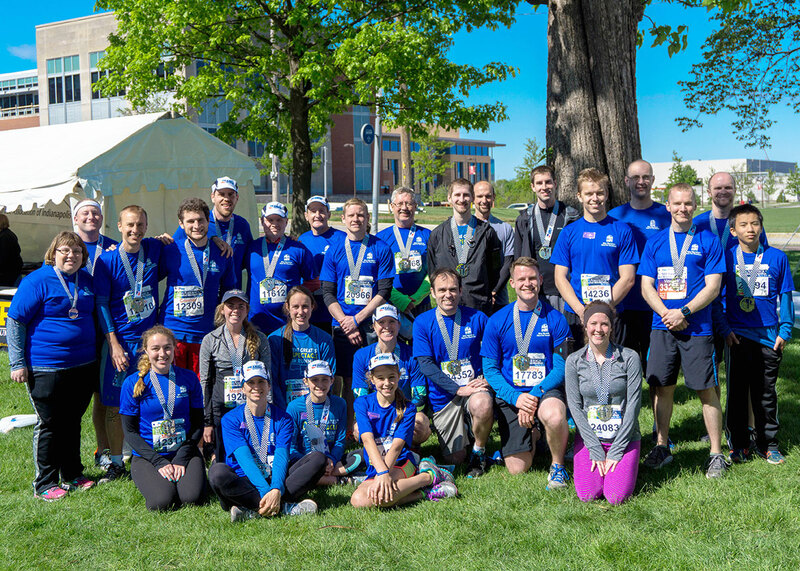 The team, sponsored by the Archdiocese of Indianapolis, was unified in wearing blue shirts that promoted vocations and in spirit through praying for vocations during the events and in their training leading up to them. In addition to religious like Brother Peduru, there were also many seminarians, priests and lay Catholics who were part of the team. Lynne and Kelsey Kluesner, both members of St. Martin of Tours Parish in Martinsville, were a mother/daughter pair on the team. Lynne walked the 5K, while Kelsey ran the Mini. The night before the Mini and 5K, many team members gathered at St. John the Evangelist Church in Indianapolis for a Mass for vocations. A pasta supper was held afterward under a tent in the church parking lot. Father Michael Keucher, associate pastor of Our Lady of the Greenwood Parish and a team organizer, was the homilist at the Mass. He said that the team members, and all Catholics, need to set a good pace to compete well in the journey of faith. He took each of the letters of “pace” to give advice on how to do this. “P” stood for prayer for Father Keucher.